CONNECT WITH MEXICAN FOOD ON A DEEPER LEVEL. 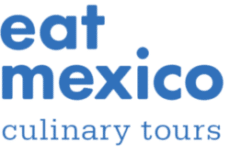 WHY EAT MEXICO CULINARY TOURS? When we say small, we mean small. Our maximum group sizes range from 4 to 8 people. The average group size is 3. We’re firm believers that a small group is the best way to get to know this complex cuisine. Our bilingual local guides have studied Mexican gastronomy in local cooking schools and worked in local kitchens. They know the deeper story on Mexican food and they're ready to share it with you. Our tours go beyond simply feeding you a taco. We talk about Mexican food history and provide important cultural context. We'll help you connect the dots so you can truly begin to understand Mexico’s thriving food culture. Eat Mexico donates a portion of our yearly profits to Mexican organizations working to fight hunger, empower women entrepreneurs, and care for at-risk Mexico City youth. Here’s a small selection of some of the organizations to which we’ve donated.